Fundamentals Part2: Felix Prangenberg — WETHEPEOPLE BIKE CO. The newest member of the PRO squad, Felix Prangenberg is part of a new breed of all terrain shredders that can quite simply, ride everything. When Felix first came to the office to build his new WTP steed he was very set on riding the Patron frame. Our team designed street sled, the Patron is tough in all the right places with dialled geometry making it the perfect weapon of choice for a rider like Felix who changes it up all the time. Park, Dirt, Street, you name it, the Patron can handle it. 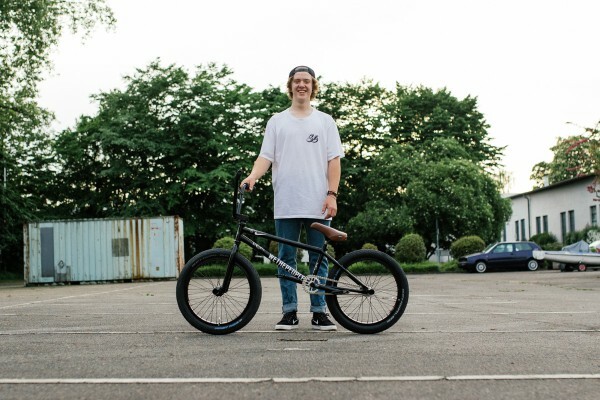 We caught up with Felix to find out exactly what makes the Patron frame such a good match to his riding, and why riding a WTP frame really makes the difference to his riding. Felix, explain your current setup at the moment? I'm riding a Patron frame in 20.75" with Pete Sawyer signature Sterling Bars and Forks. All in Gloss Black. On top of that I ride ALL WTP parts with Schwalbe Tires and a few Eclat bits too. What is it about the Patron frame that you like so much? The D-shaped tubing on the chain stays was something that really caught my eye at first. It's super tough and dent resistant, and on top of that makes the backend real stiff, I don't have to worry about it failing on me during big stuff. What do you like about the geometry? Well, I always wanted to ride shorter chain stays. The Patron has a 13.25" backend, so it’s so good for tricks where you actually have to pull hard, it just makes it easier in my opinion. I love to do a lot of flat drops and it feels good to do it on a frame that feels super solid under my feet! What do you think about the progression of WTP frames? Well I’ve been riding a 20-inch bike now for 4 years, so not as long as some of the guys on the team! Every frame I before my WTP had really long chain stays but I’m currently riding the Patron frame and couldn't be happier, it’s so good for street stuff. Manuals are way more easier, tricks where I had to pull really hard now just feeling like nothing at all. I've always known and trusted WTP products because you know they have been tested really hard, I really think WTP opened the door for development in modern street frames. The Patron Frame is available now worldwide in 20.75" and 21.15" sizes. Like ALL of our after market frames, the Patron carries our Lifetime Guarantee, so if you're looking for a frame that's built to withstand the rigours of heavy street riding and one thats going to last, look no further. Take a closer look at the Patron frame HERE.